This is a very simple way to prepare them, but looks elegant enough to make a weeknight dinner special. Make a bundle with a single-serving amount of asparagus. Cut 2 slices of prosciutto in half or thirds lengthwise, forming small ribbons. Wrap them around each bundle and place on a baking sheet lined with aluminum foil. Drizzle a little olive oil over it, rubbing it around the surface with your fingers or with a silicone brush. Season lightly with salt and pepper (prosciutto is salty, go easy on the salt). Bake in a 400F oven until the asparagus are starting to brown on the edges – 20 to 25 minutes. Add shaved parmiggiano and bake for a couple of minutes. Sprinkle extra black pepper right before serving. 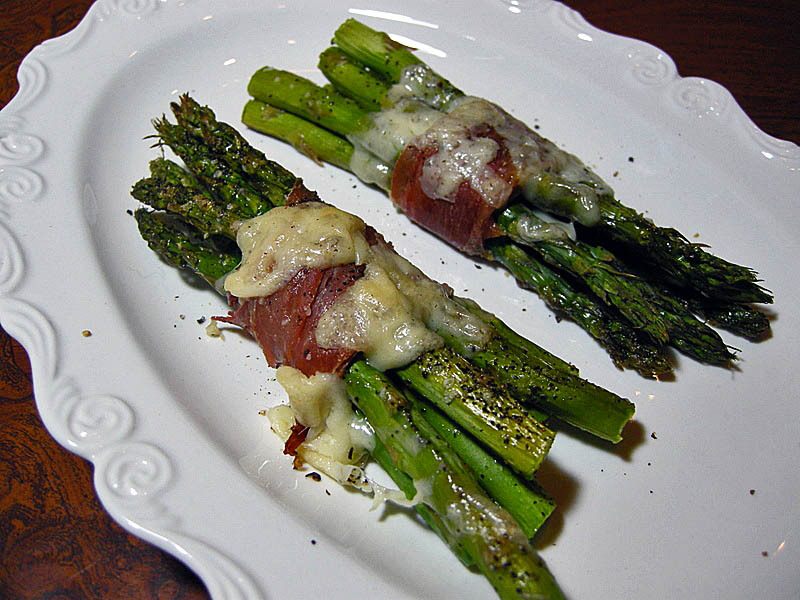 Comments: Roasted asparagus are always showing up as a side dish in our home, the addition of prosciutto is a nice variation. We enjoyed it with a delicious grilled salmon and white rice. I did not give credit to a particular source for this recipe, because I’ve been making it for years, I probably saw it in some publication long time ago. However, it’s so simple that it hardly qualifies as a real recipe… I’ve made it with regular ham and it works well too, but I prefer the extra-bite the prosciutto provides. Very stylish, loved this presentation, Sally! I also cannot resist certain types of food, I feel bad when they come from far away, but… enjoy them anyway. Guilty pleasures, eright? Oh my word that looks delish! I have a completely unrelated question for you- but I didn’t see an email address. It’s a pergunta Brasileira! I love how you inserted the pronunciation in your Pao de Queijo recipe. Could you point me in the direction of how I might do that?? well, it wasn’t very easy to do that, at least not for me, I am a little HTML-challenged.. First of all, I had to download a program to tape my voice, I used one called Audacity, available for free. Once I taped the sound, I had to upload it to a host in the net, get the link and use that to download it to WordPress and insert it in the blog. A bit convoluted, but it worked. Your blog is hosted by Blogger, not sure how it would work, but probably in a similar way. Let me know if you have more questions about it…. I always cave and have to bring home a tomato or two in the middle of winter, so I understand! 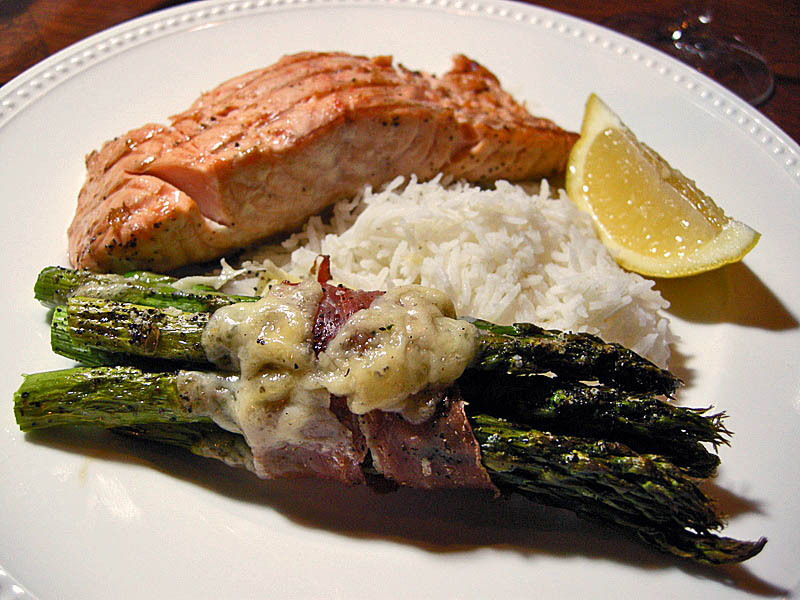 And, asparagus is so good with salmon.